One of the biggest challenges of looking after all the “stuff” in our heritage collections is making sure our catalogue records are accurate and up to date. We use a few different catalogues and metadata standards to record and keep track of information about the tens of thousands of books, archives, records, paintings, and museum objects in our collections, but every once in a while we discover that something has been missed. 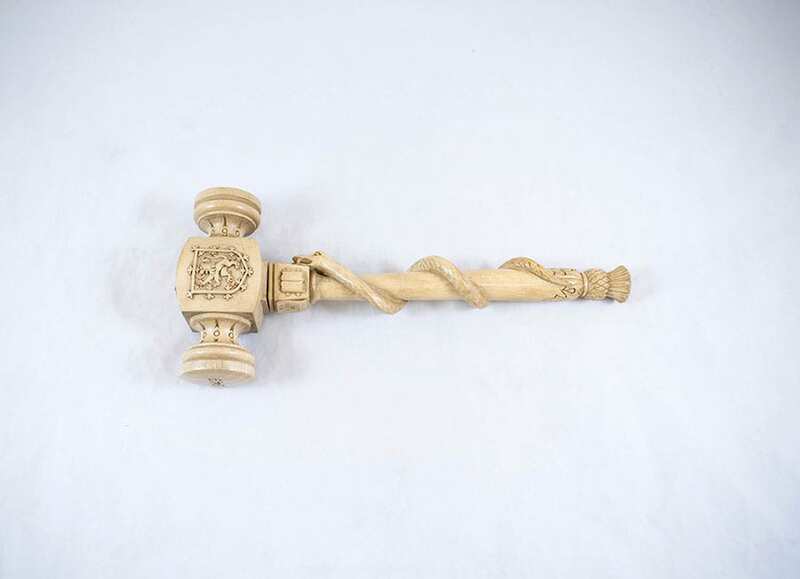 It doesn’t occur very often, but when it does it tends to be an item that has been in the collection – and on display in the same place – for a long time. This happened recently when we decided to move a small wooden box that had sat by the fireplace in the College Hall for as long as anyone in the Heritage team remembers. We’ve now catalogued the box and its contents, and added it to the Museum Collections section on our website. 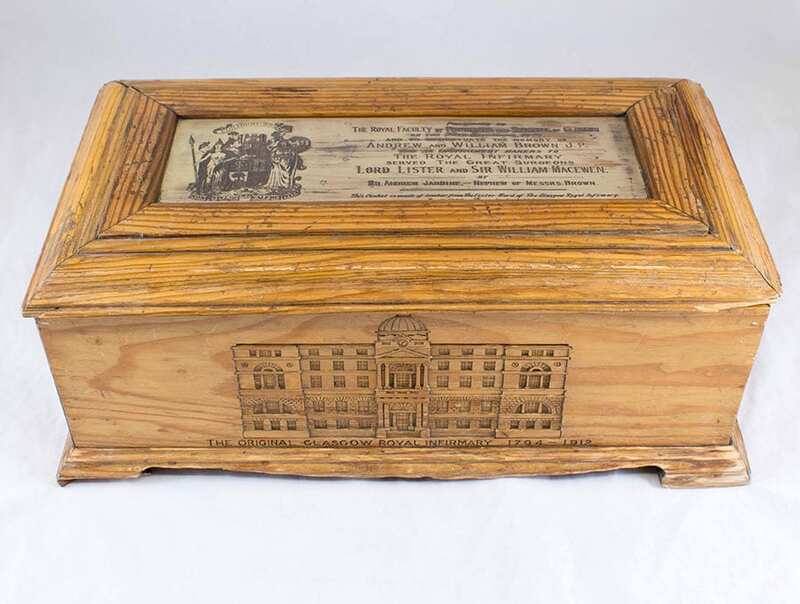 The box was presented to the Royal Faculty in 1949 by Mr Andrew Jardine in order to commemorate his uncles, Andrew and William Brown, who were both instrument makers to the Glasgow Royal Infirmary in the late 19th and early 20th centuries, and made surgical instruments for such famous figures as Joseph Lister and William Macewen. 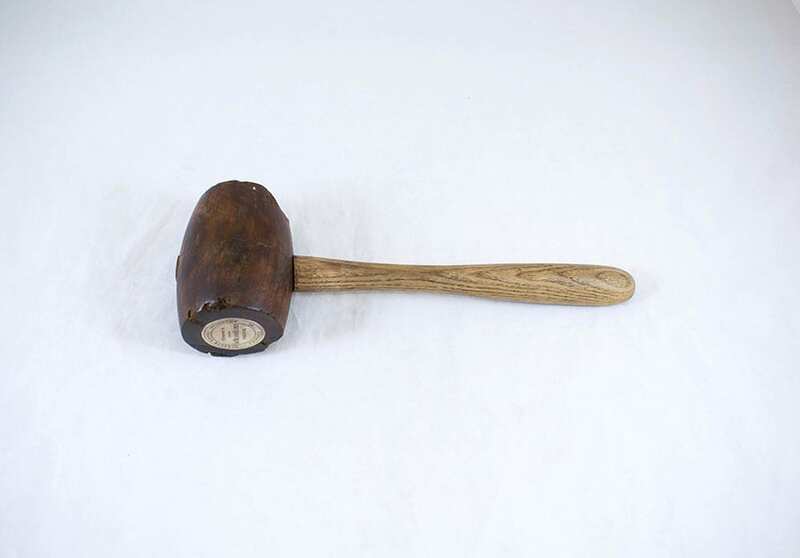 Andrew Brown was primarily a tinsmith, and has featured in a previous blog post on Glaswegian instrument makers. A photograph of the Brown brothers can be seen inside the lid of the box. 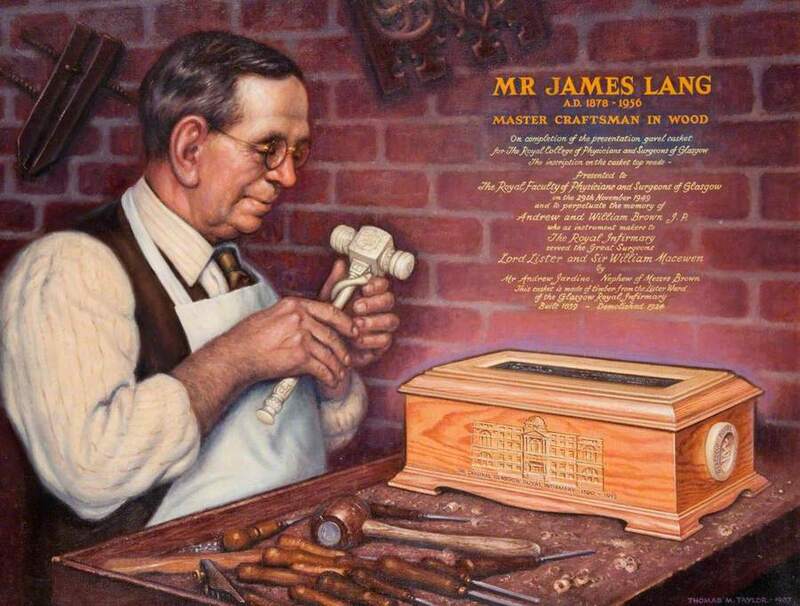 The box was made by the master craftsman James Lang, using timber salvaged from the demolition of the Lister Ward at the Royal Infirmary in 1924. 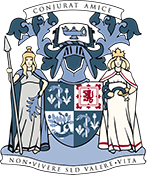 It features carved decorations illustrating the original Royal Infirmary building (demolished in 1912), the emblem of the Royal Infirmary (an intertwined serpent and thistle and the motto, “Auspice Caelo”), and the emblem and motto, “Cave Adsum” of Clan Jardine. 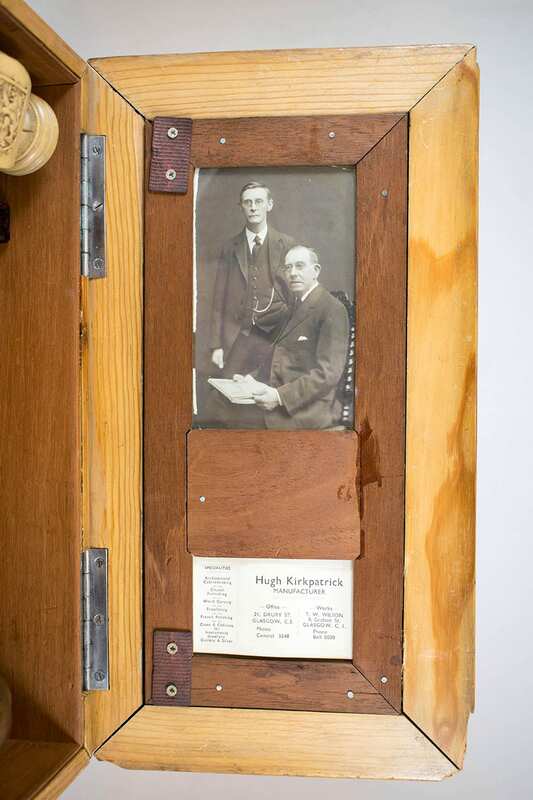 Many items in the collections have supporting paperwork, but this box is unique in being accompanied by a documentary oil painting, which shows Mr Lang with the finished box in the Drury Street workshop of his employer, Hugh Kirkpatrick. The portrait is in fact posthumous; Mr Lang died in 1956, and this painting was completed by the artist Thomas M. Taylor in 1987. 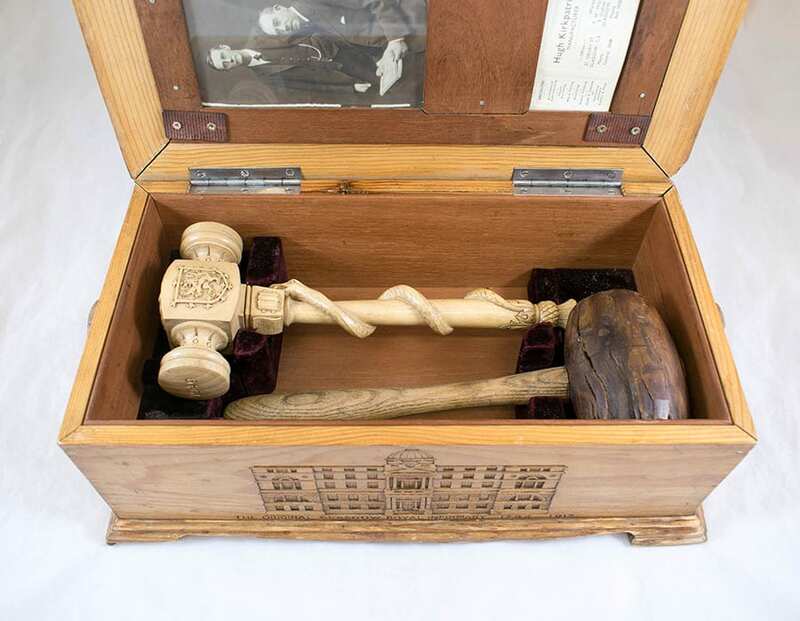 Now that the gavel casket and its contents have been fully catalogued and photographed, we’ve placed them in the Lister Room in College, alongside other items like a table and fireplace from Lister’s ward at the GRI.